Incense are said to be calming, relaxing and cleansing. Aromatic scents create a mood-lifting atmosphere that help center the mind. 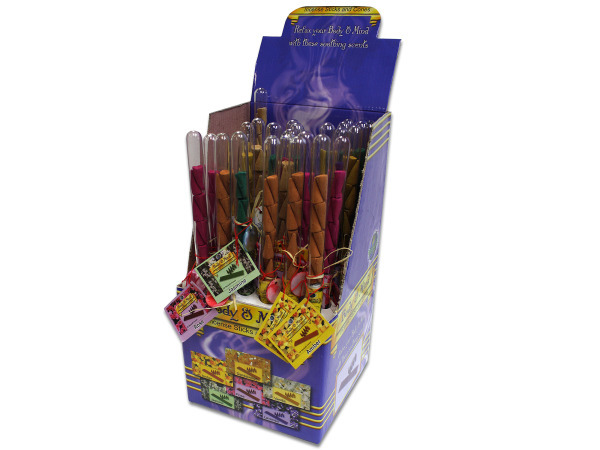 Each display comes with 36 glass tubes filled with 8 cone-shaped incense and 20 sticks. Scents include: amber, sandalwood, vanilla, jasmine, rose and lavender. Comes packaged in a convenient PDQ for easy shelf display. Each tube measures 11 3/4". 36 pcs. 72 pcs. 108 pcs. — 144 pcs.